Chiropractic care is one element of a healthy lifestyle, one thing that helps keep your body working the way it was designed to. Chiropractic doesn't treat or cure any disease; instead, it enables your body to better fight disease and helps strengthen you immune system, as well as relieving pain. Chiropractic alone isn't enough to keep you healthy. If you visit the chiropractor regularly, that's great, but if you're also putting food into your body that isn't what it needs, if you're not exercising regularly, if you're not drinking enough water or getting enough sleep, you won't be healthy. 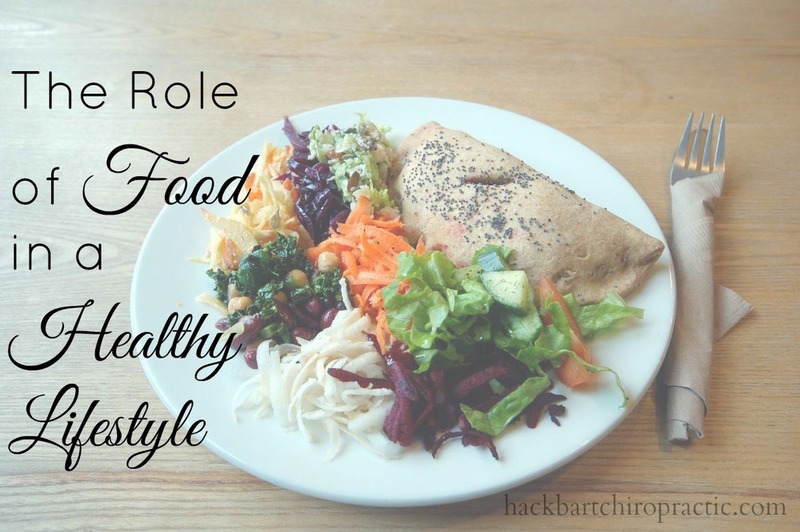 What is the role of food in a healthy lifestyle? Well, we all know that food is what gives us energy. More specifically, our bodies need calories (in the form of fats and starches) to burn for energy, so all the body functions can work. Our bodies need protein to build and strengthen our muscles so we can move. Our bodies need vitamins and minerals to perform all its essential functions. Our bodies need plenty of water for everything! What foods give us these essential nutrients? Fresh fruits and vegetables. Meat and eggs. Dairy products. Healthy, natural fats like butter and plant oils such as olive and coconut. Some whole grains, although some people have to be careful with this. Many "foods" contain preservatives, chemicals to affect their color, taste, or texture, added processed sugars, chemically-produced fats such as margarine, canola oil and shortening--all things our body doesn't need.Not only do our bodies not need these things for proper function, but putting those things in our body actually inhibits its ability to function optimally. Our body has to work extra-hard to clear out all the unnecessary things so it can absorb the good stuff that it actually needs. So just as eating whole, real, natural foods helps keep your body healthy, eating processed, fake and not natural foods can contribute to disease. Now, there's nothing inherently wrong with eating the occasional candy bar, doughnut, or Big Mac. It is important, however, to keep our intake of those foods that aren't good for us to a minimum, and fill our menus and stomachs with food that is nourishing and will actually improve our health. Start a garden if possible and grow your own produce, a much cheaper option than the grocery store or even the farmer's market. Skip the coffee shop and make coffee drinks at home with your favorite coffee, milk, and a natural sweetener like honey. You'll save a lot of money! Cut out soft drinks and sugary fruit juices, and instead drink water and spend the $3-$5 that a bottle of juice can cost on some fresh fruit. Instead of buying expensive and processed lunch meat, buy a whole chicken which you can roast and make into sandwich meat, chicken soup, and homemade chicken stock. Buy frozen vegetables instead of canned if fresh ones are too pricey. Try making homemade bread to avoid the preservatives and added sugar in packaged bread. Homemade bread can be as simple as flour, yeast, water, and a little fat--very frugal and very good for you. A healthy lifestyle has many components: exercise, adequate sleep, chiropractic care, and good nutrition. Putting these components together enables your body to work to its fullest potential and keep you healthy and happy!